Browse our growing collection of case studies, white papers and resources documenting the significance of the business reporting data standard, or check out one of our Infographics to get a clear picture of the hows and whys of the financial data standard. 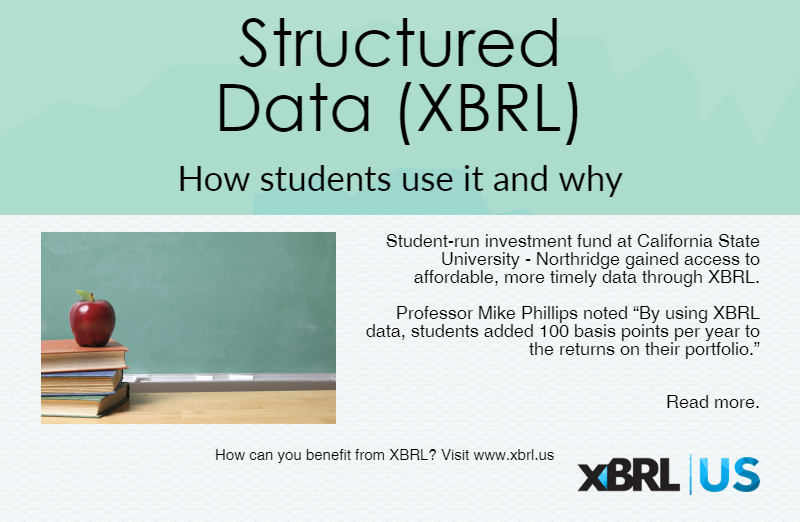 Contact info@xbrl.us to share details about your use case or tool. A one-time investment in data standards can be used by brokers to streamline their own data processing; and by surety carriers to eliminate the need for manual data entry, improve the credit evaluation process and offer better service to contractor customers. To evaluate contractor financials during the underwriting process, sureties review a Work-in-Process (WIP) schedule or series of schedules for each contractor customer. The WIP contains cost, revenue and profit data for each project in process, and is prepared by the contractor or by their accounting firm and delivered to the sureties directly or through their bonding agent. The number of projects on a WIP schedule can range from as few as a handful of projects to as many as a few hundred, depending on the contractor. Approximately eighty percent of the WIP schedules are delivered by contractors in PDF format; the remaining 20% are usually delivered in Excel spreadsheets. These documents are primarily delivered via email but occasionally can be delivered as paper printouts. All WIPs, even those in Excel, must be keyed into the surety’s proprietary financial system line by line, project by project, value by value. This task is handled by an underwriter or service team staff. Some data is calculated by the system, but most of it must be entered by hand which can take from 20 minutes to several hours for each report. Once it has been entered, the data is saved and fed through to the surety’s analytical tools so the underwriting evaluation can be performed. Because of the time involved in manual data entry, some surety carriers extract and analyze WIP data on an annual basis, but would prefer to obtain quarterly or more frequent WIP data, if the contractor can provide it. More frequent analysis would give sureties a more consistent, timely picture of how the contractor is performing and allow them to perform better ongoing evaluations. The biggest challenge in data collection for underwriting is typically the amount of time required to manually retype data from each WIP report. There can be a lot of information in a WIP, depending on the size of the contractor and the number of projects that the company has underway. Typically, WIP reports are submitted by contractors at the same time each year, so a single underwriter may receive 50 WIP schedules from different contractors simultaneously, depending on their assigned book of business. A second issue is the need to translate data in the WIP schedule. Different contractors may use different terminology for the same data fields, which requires interpretation on the part of the individual keying in the data. This requires the surety to provide more training for data entry staff as they must be knowledgeable about the data they are entering in order to interpret the columns of data accurately. The need for ongoing translation slows down data entry and has the potential to result in inaccuracies in the information used for underwriting. The current process can be error-prone, relying on individuals to extract small bits of information from what can be very large spreadsheets or PDFs with rows and rows of data to rekey. The data is often in small print and previous scanning of the documents can deteriorate the legibility. The inefficiency of the process means that the underwriter must analyze contractor financial performance using often outdated and potentially inaccurate data. Today’s manual data collection process has a negative impact on contractors. Sureties cannot respond to their need for credit on a timely basis, and the data used to assess their financial status may be outdated or even erroneous. The Hartford took on the challenge of testing out the premise of using standards to transform their internal process. “Using data standards to automate data collection is an important step towards modernizing the surety industry, and improving the timeliness and accuracy of our underwriting services to contractors,” said Rick Ciullo, Chief Operating Officer of Hartford Bond. With standards, The Hartford eliminated the rekeying of data; and automatic extraction made WIP information immediately accessible to their underwriters as soon as the report was received from the contractor. This reduced errors and labor costs, and allowed The Hartford to be more responsive to contractors. Automation allows The Hartford to process WIP reports more frequently than just at the annual renewal cycle if the contractor is able to provide them, with little to no extra work required for processing. Additionally, the process for agents and brokers to collect and transmit the information becomes easier when the data is standardized and can be automatically extracted and used. More frequent and timely reviews of contractor WIP data will increase the accuracy of their analysis and allow them to serve contractor clients faster and with greater precision. Technology staff at The Hartford reviewed the WIP Taxonomy which contains approximately 70 data fields reflecting cost, revenue and profit as well as other information contained in a WIP. Each data field in the taxonomy is further defined by detailed contextual information (metadata) including definition, data type, period type and authoritative accounting references. The diagram below shows a portion of the taxonomy hierarchy for contracts, with revenue elements highlighted. One of the challenges in capturing WIP data, as noted earlier, is that contractors may use different terminology for the same data field. 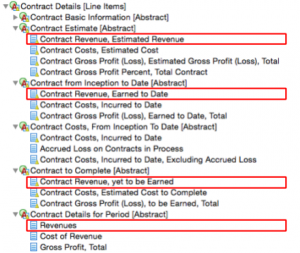 When extracting data from PDFs or Excel spreadsheets, the column and row headers vary from contractor to contractor, making it painstaking and time-consuming to identify reported values and database them appropriately. The benefit of using the standardized WIP taxonomy is that metadata associated with data fields makes them more clearly understood by contractors, bond agents and sureties so the appropriate name can always be identified. The Hartford mapped the data field labels in the taxonomy to the field labels in their internal financial system. The process took one individual approximately 8 hours. Additional time to full production implementation including testing and rollout will be approximately 50 hours. The details available for each data field in the taxonomy made it relatively easy to perform the mapping because of the clear definitions. Going forward, because this matching process has been completed, it will be no effort to pull in additional WIP reports. With the new standardized process, when a WIP in XBRL format is received, with one keystroke, the underwriter can automatically populate the database with figures from a contractor WIP. The diagram below shows The Hartford’s WIP template which now, with standards, can be populated with contractor data with a single keystroke. Before standards, manual entry of a WIP report containing 13 rows of data like the report above, would have been a 30 minute exercise but with standards, it takes about 3 ½ seconds. The data is immediately live, stored in The Hartford database, and ready to be used in credit models. Another WIP report containing hundreds of additional rows of data would take the same 3 ½ second timeframe to consume into The Hartford’s database. Between the anticipated technology cost for full implementation and the anticipated efficiency gains, The Hartford expects to cover implementation costs after approximately 110 WIPs are processed through the new method. Automation helps to solve the challenge of how to consistently and accurately consume financial data from contractors into a surety’s financial database. Using standards should reap benefits to sureties and to contractors for years to come. Sureties can gain from a more efficient, streamlined process. Contractors can gain from getting potentially faster access to credit and the comfort of knowing that the financials used to evaluate them are current and more uniformly identified. To fully recognize the benefits of standards, across the supply chain, requires further engagement with sureties, bonding agents, contractors and accounting firms. By working together, the industry can improve the underwriting process for all stakeholders with greater timeliness, more accuracy and better communication between sureties and contractors. The Hartford is Hartford Fire Insurance Company and its affiliated property & casualty insurance companies, Hartford Plaza, Hartford, CT 06115*. Applicants are individually underwritten and some may not qualify. Specific features, credits, and discounts may vary and may not be available in all states in accordance with state filings and applicable law. The Hartford® is The Hartford Financial Services Group, Inc. and its subsidiaries, including Hartford Fire Insurance Company. Its headquarters is in Hartford, CT.
Get the big picture on selected topics with one of our standardized financial data infographics. Auditors evaluate the reasonableness of client projections such as future revenue growth, profitability and capital expenditure requirements. To evaluate the reasonableness of these projections, BDO USA, LLP often looks at data from similar companies within the same industry. 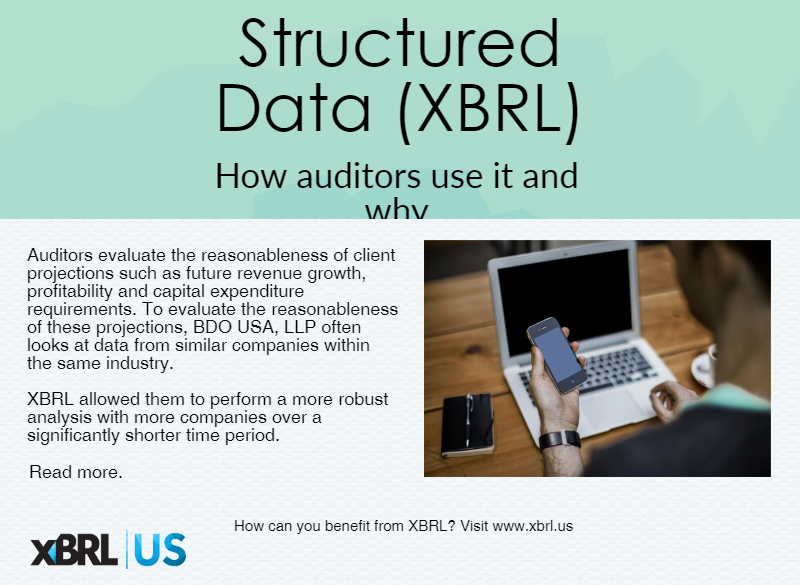 XBRL allowed them to perform a more robust analysis with more companies over a significantly shorter time period.